Offers 360° of relaxation and grooming for your cat! If your cat likes catnip, The Catit Senses 2.0 Wellness Center will be your feline’s new favorite hangout spot. Add catnip herbs to the massager on top, or spray catnip onto the cushion and watch as your cat relaxes. The Catit Senses 2.0 Wellness Center combines the old Massage Center with a few smart upgrades, based on extensive field research and direct user feedback. The product is now bigger, better and more versatile than ever! Cats like to keep clean and groom themselves. To help them along, the product includes dual brushes combs to remove and collect loose and shedding hair. The Catit Senses 2.0 Wellness Center was designed to be the ultimate relaxation spot. The Wellness Center includes a wide variety of brushes, textures and massage ridges to help your cat relax and groom itself. 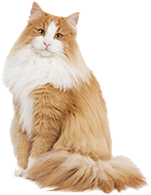 All of the features are easily accessible from all sides to suit any cat’s personal preferences and grooming habits. 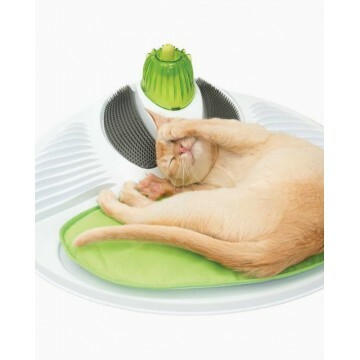 At the very top of the Wellness Center sits a special massager that is ideally shaped for your cat’s head, neck and face, and is a great instrument for relieving stress and relaxing in general. The green padded cushion is perfectly sized for a lie down or nap and feels comfortable to the touch. The cushion includes a set of velcro adhesive strips to secure it in place on the Wellness Center. Good dental hygiene helps prevent illness and bad breath. While your cats are gently gnawing on the textured nub of the gum stimulator, they are actually cleaning their gums and teeth. You can stimulate your furry friends by adding catnip herb to the top. Important! Reduce the amount of catnip or remove the gum stimulator when you feel your cats are in danger of hurting themselves because of their excitement. 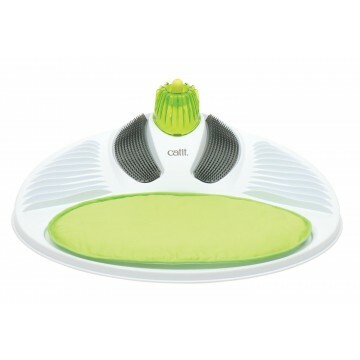 The Senses 2.0 Wellness Center has a low ergonomic base with wavy massage ridges on either side. These will help satisfy any itch that needs scratching and/or massaging, even in those hard-to-reach areas. The Senses 2.0 Wellness Center is easy to disassemble and clean. The cushion can be wiped clean with a damp cloth, while the plastics can be hand-washed. It’s best to use natural soap that is free of chemicals or abrasive solutions and rinse thoroughly afterward. Always supervise your cat when using catnip on the Wellness Center top. Immediately lower the amount of catnip when your cat starts violently biting the green top to prevent it from hurting itself. Start with low amounts of catnip and build up gradually. The amount of catnip used is key for a safe usage of the Wellness Center. Catit Senses 2.0 products were specifically designed to be mixed and matched, so you can create a new set of toys and change your cat’s play environment frequently to keep them interested.